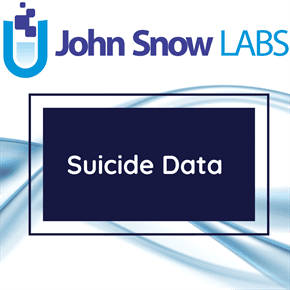 This dataset consists of information available over the internet for the reasons and methods used for suicidal attempts and their relevant ICD-10-CM codes and UMLS concept IDs. Reasons like depression and various mental disorders that lead to suicide can be treated with medication and counseling. Although the treatment plans vary from patient to patient, general treatment options available have been mentioned in this dataset along with their NDC Product Codes. Suicide is the act of intentionally causing one’s own death. Risk factors include mental disorders such as depression, bipolar disorder, schizophrenia, personality disorders, and substance abuse, including alcoholism and use of benzodiazepines. Other suicides are impulsive acts due to stress such as from financial difficulties, troubles with relationships, or from bullying. Those who have previously attempted suicide are at higher risk for future attempts. Suicide prevention efforts include limiting access to methods of suicide, such as firearms, drugs, and poisons, treating mental disorders and substance misuse, proper media reporting of suicide, and improving economic conditions. Although crisis hotlines are common, there is little evidence for their effectiveness. The most commonly used method of suicide varies between countries, and is partly related to the availability of effective means. Common methods include hanging, pesticide poisoning, and firearms. Suicide is the 10th leading cause of death worldwide. Approximately 0.5% to 1.4% of people die by suicide, about 12 per 100,000 persons per year. Three quarters of suicides globally occur in the developing world. Rates of completed suicides are generally higher in men than in women, ranging from 1.5 times as much in the developing world to 3.5 times in the developed world. Suicide is generally most common among those over the age of 70; however, in certain countries those aged between 15 and 30 are at highest risk. There are an estimated 10 to 20 million non-fatal attempted suicides every year. Non-fatal suicide attempts may lead to injury and long-term disabilities. In the Western world, attempts are more common in young people and females.